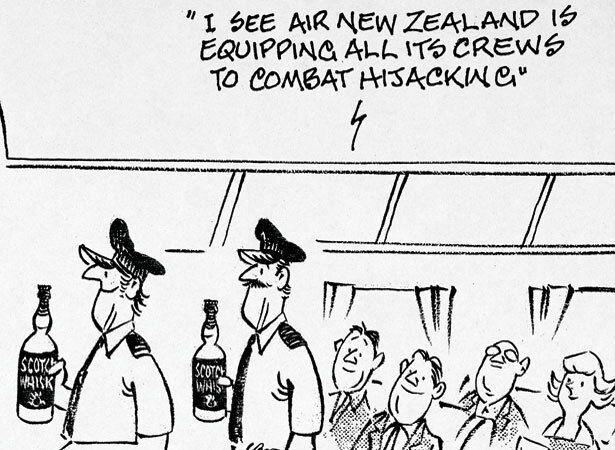 Cabin crew foiled the attempted hijacking of an Air New Zealand Boeing 747 at Nadi airport, Fiji, by striking the hijacker on the head with a whisky bottle. Flight TE24 was en route to Auckland from Tokyo when it made a scheduled refuelling stop in Nadi. Ahmjed Ali, a Fiji Indian who worked for Air Terminal Services, walked onto the flight deck, and revealed to the captain that he was carrying dynamite. Ali wanted to escape from Fiji, where the elected government of Prime Minister Timoci Bavadra had been overthrown by a military coup d’état five days earlier. All 105 passengers and 21 cabin crew disembarked while the drama unfolded in the cockpit. For six hours, Ali talked to relatives in the Nadi tower and Air New Zealand negotiators in Auckland. At around 1 p.m., while Ali was distracted with the radio, flight engineer Graeme Walsh hit him with a bottle of duty-free whisky. The crew overpowered Ali and handed him over to local police. He received a suspended sentence for taking explosives onto a plane. We have 12 biographies, 6 articles, related to Attempted hijacking in Fiji foiled.